On the occasion of the festive reopening of the Mauritshuis Museum Bredius organises the exhibition: Connoisseurship: Bredius, Jan Steen and the Mauritshuis. • Download the Dutch catalogue here. • Download the English catalogue here. 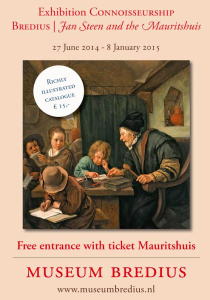 From June 27th to January 8th 2015 Museum Bredius exhibits paintings by Jan Steen. The heart of the exhibition is formed by the nine works collected by Abraham Bredius (1855-1946), director of the Mauritshuis between 1889 and 1909, which are complemented by 11 paintings from public and private collections. Those paintings were mainly chosen from Jan Steen’s early period, an aspect of his art that was paid little attention to in the great Steen-exhibition in 1996 (Jan Steen, painter and narrator, Rijksmuseum Amsterdam). It is meant to illustrate the origin of his artistry and explain how in just a few years he developed from a landscape painter to a figure painter. Six landscapes and one townscape were selected for that. To show Steen’s development to figure and genre painter a key work is on exhibition for the first time since 1926: the Fable of the The Satyr and the Peasant from the collection of the founder of Koninklijke Philips NV, Dr. Anton Philips. It was his favourite work of art and he parted with it for an exhibition only once. Museum Bredius will show this canvas in all its lustre after it underwent full restoration earlier this year, especially for this exhibition. A number of the selected paintings have never been exhibited. Museum Bredius is the first to show one of the most important discoveries of recent years, Steen’s Stellio deriding Ceres, based on Elsheimer. It is one of the few nocturnal scenes painted by Steen and the story was derived from Ovid’s metamorphoses, the painter’s bible, as Carel van Mander used to say. The exhibition is organised in cooperation with the Koninklijk Kabinet van Schilderijen het Mauritshuis, Haags Historisch Museum, Stedelijk Museum De Lakenhal in Leiden and the Fondation Custodia (Collectie Frits Lugt) in Parijs, Koninklijke Philips Nederland en several private persons. The catalogue contains an extensive discussion of Abraham Bredius’ relation with Jan Steen. Apart from Rembrandt, Bredius found Steen the nest Dutch painter ever. He wrote a monography about the artist, which was published in 1927 and is still regarded as an invaluable book of reference. Especially for Bredius the first copy of this heavy – and precious – tome was bound in parchment at a design of C.A. Lion Cachet (1864-1945) and will also be exhibited. The catalogue was written by Guido M.C. Jansen, former curator 17th century painting of the Rijksmuseum and project manager of the exhibition and editor of the catalogue Jan Steen: painter and narrator. The catalogue is preceded by a biography of Abraham Bredius by Josefine Leistra and an art historical description of Lange Vijverberg 14, the premises housing the Bredius collection since 1914. Huygens around the Hofvijver is a joint presentation of the Haags Historisch Museum and Museum Bredius . Constantijn Huygens’ (1596-1687) bond with The Hague is central in a presentation in the Haags Historisch Museum. With this link you can download the (Dutch) catalogue about Huygens connoisseur and collector. A special Huygens route will show us his love for his birthplace, his involvement with several The Hague building projects and his contacts with the House of Orange. Museum Bredius will present an exhibition on Constantijn Huygens as a connoisseur and art collector and acquaint us with Huygens’ personal taste showing paintings by 17th century masters like Rembrandt, Jan lievens, van Goyen and Honthorst. Also Huygens’ role as an art intermediary at the court and his numerous contacts with painters and architects will be paid attention to. More than thirty paintings will be exhibited, two of which actually used to be part of Huygens’ own collection. Special combination tickets are available for Huygens around the Hofvijver (€ 10, including admission, a richly illustrated catalogue and a practical walking tour through the centre of The Hague featuring important places of Constantijn Huygens’ life. The tour can also be bought separately in the museum shop (€ 1,50). From October 11th 2011 to January 15th 2012 the exhibition Tall and Small can be visited in Museum Bredius. For the first time antique Dutch miniature silver will be on display next to the life-size silver objects from which they were copied. Hundreds of miniatures from the collection of Museum Bredius and The Hague antique dealer and jeweller A. Aardewerk will be complemented with loans from international private collections. The more than 80 pieces of miniature silver in the Bredius collection gave rise to this exhibition. In the second half of the 17th century miniature silver became the fashion in the Netherlands. Well-to-do ladies, especially in Amsterdam, decorated cabinets as doll’s houses, which were subsequently furnished with miniature silver. This was an expensive hobby, as the miniatures were made of the same materials as the coins in those days. Doll’s houses turned into status symbols and became all the rage in the 18th century. Miniature silver was in demand in Amsterdam so much that generations of silver smiths specialised in making this ‘poppegoet’ (doll’s stuff), as miniature silver was referred to in those days. Apart from furniture also a number of crafts, sports and means of transport are exhibited in miniature silver. Several very rare pieces are a sundial, a four poster, a billiard table and even a merry-go-round. Surprising Restorations. Seventeen restored paintings. 2009: Surprising restorations. Seventeen restored paintings. Masters and Windmills. From Rembrandt to Mondriaan. 2007: Masters and windmills. From Rembrandt to Mondriaan. 400 Years of pipesmoking in pictures. Organisation: Charles Dumas, Hermance Schaepman, Nicole Hermans a.o. Catalogue: Albert Blankert, with contributions by Theo van Velzen and Louise Barnouw-de Ranitz.